Poured from a 12 oz. bottle into a tulip pint glass. A: Opaque black color with two fingers of persistent beige foam head. Heavy lacing remains on the glass. S: Coniferous hops are potent, almost one-note, with only fine threads of earth and chocolate syrup detectable. T: Begins off-dry, with assertive and husky roasted malt that is just as dominant in the first act of the flavor as hops were in the smell. A darkly unctuous quality is also present early. Acidity is restrained into the middle, where piney and herbaceous hop flavors begin to rise until an equilibrium with the malt component is reached. Earthy minerality surges last, joining the other flavors already established, as well as a late whiff of freshly-ground coffee, in the moderately bitter finish. M: Thin to medium viscosity, wet and slightly sticky on the palate, with low carbonation. D/O: This stout hits a sweet spot with a precision that is almost peerless at times. Considering the fact that it weighs in under 7% abv, the economy of the sensory qualities encountered here are truly remarkable. While the smell is a bit overpowering and not especially to-style when taken alone, it offers an interesting contrast to the flavors that are initially malt-forward. This may be the Krebs/Choc beer that the world has been waiting for. Poured a deep black, with a nice creamy and long lasting head. The smell is very roasty and has a big dank juniper hop quality to it. This is a very hoppy stout, almost bordering on black ipa. Very roasty and smokey with a lot of black charr and a big blast of dark green and juniper hops, has a nice long bitterness with the deep black flavors mixing in with all the hops. Thhe mothfeel is full and very resiny. This beer is a bit one dimensional and not at all balanced, but I really like it none the less, a great hoppy stout. Pours a dark brown, almost black with a big dark tan head, a mix of big and little bubbles. Flavor is a a monstrous dry stout bomb. Lots of bitter notes. Lingering dryness. Slight acidic prickle. Definitely some hops in there with some pineyness in the mix. Also maybe a bit of cab sav red wine in the mix. Overall, this is a great dry stout. Personally though, I would have liked just a little bit more malty sweetness to balance things out. Probably their best bottled beer. Pours black as night with a somewhat slight, though creamy, head. Creamy and light roasty notes in the nose with slight coffee and chocolate notes. More of the same in the taste, but with a nice smack of bitterness followed by the roasty and then creamy notes. Some nice dark chocolate throughout, but the overall impression is of something soft and creamy with a background of bitterness and chocolate- think of a pretty good cup of coffee- but with a lot of cream. That makes the whole package a little simpler than it might be, but it's still a pleasant beer and a change of pace. It's black with a tan head. Lots of luxurious tiny bubbles. Wonderful head retention that last till the bottom of the glass. It smells like piney/grassy hops. It's also got a bit of burnt coffee aroma. But NOT in a bad way, it smells fabulous. It's rather hopped. There are a lot of piney and grassy hop notes. There is also a hint of coffee to this beer. But the best part is the chocolate notes that come out on the backside of it. Delicious! It's soft and velvety. Very comforting. This beer was a pleasure to drink. I really enjoyed it and it hit the spot on a cold Missouri night. Thanks to Freddy at the Biergarten for the reccomendation. 12 oz bottle poured into a Sam Adams glass. Two finger head and good lacing, thickly pours an opaque black. Aroma is black currant, chocolate, and roasted toffee. Wow, taste is very complex - espresso, licorice, dark fruit, chocolate, and citrusy pine all present. Thick mouthfeel and nice dry finish. Overall this one is a surprise and easily the best offering from Choc I've ever had. It even stands up pretty well with many of the better Imperial Stouts I've had. Pitch black and dense. A frothy head that dissipates into a visible ring around the edges, some lacing. Big roast and earthy hops on the nose, with some baker's chocolate. Big on the hops again on the tongue, with roast and baker's chocolate. A bit too much on the hops in fact which results in a bit of astringency. Thin medium, with low carbonation. A good, under the radar beer that could use a little less hopping in the boil in my opinion. But a good start for a solid American Stout. A nice surprise to find this already on the shelf for Halloween consumption. Tar black with mocha colored foam that starts creamy but fades to a thin cap. It's a blast of roasted malt and fairly aggressive hopping that I wasn't expecting from Choc. Char, strong espresso, and bitter cocoa fight it out with the Citra and Centennial dry hopping for supremacy. Neither win, but the effect is something like chocolate covered grapefruit. Bitterness hits just about perfect - assertive but not detrimental to drinkability. Bit of astringency on the finish, but the slight warming sensation really makes this a nice winter drinker. The only real flaw seems to be the lack of mouthfeel and creaminess that would take it from damned good to out of sight. An upgrade from Baltic Porter to say the least, Choc really let loose with this one and I can see myself buying multiple six packs in the coming months. 2012-13 12 oz bottle served in a snifter at about 55F. A good looking stout with an opaque, brown-tinged, black body topped by a well-proportioned, partially durable, mocha tan head. Lacing blankets the glass with every tip. Traces of sediment in the bottle after the pour. Aroma: Notably hoppy, with more hop aroma than dark malts. Spicy with a hints of citrus and pepper. Taste: The hops added a nice spicy tone to the rich dark-roasted malts that dominate the flavor. Hints of vanilla, chocolate and coffee. Has a touch of Rogue-ish earthiness and a touch of tartness. Slightly more bitter than sweet. Feel: Medium+ and "chewy" body with well-chosen, soft, medium carbonation. O: A fine, hoppy American style stout; very flavorful without being at all challenging to drink. A - Reddish/brown head on top of motor oil black body. T - Follows the nose with fresh roasted espresso, roasted malts, green pine needles, cocoa. Citrus hops blast in on the finish to create a very fresh and clean bitterness. M - Medium body with moderate tight carbonation. Very focused flavors. The espresso flavor really stands out as fresh and high end tasting. The citrus and cocoa play off each other very well. The end result is a fantastic stout. Just did a blind taste test with this and 2 other very good stouts. Went to my favorite Beer and Wine shop, Hop City Beer and Wine and got a this offering in a growler. Poured a two finger head, very dark almost black and has very good lacing. The nose begins with a sweet malty yet hoppy aroma. The taste kinda puts me in the mind of a Black IPA as the hops are somewhat prominent, which I like, but then the chocolate malts come through which are in the stout vein. It's a light mouthfee which I would be better in my opinion medium. Overall I'm really enjoying this one and will have again. Choc really nailed this one. A nice dry-hopped stout. A- Poured out of a 12oz bottle into a Choc snifter. Dark as stouts come. Just a couple shades from black. Nice and very creamy tan head that likes to sit around lazily for a minute or two. As the drink goes down it leaves a little patchy lacing. Very good looking stout. S- mmmm. Nice and light roast character. Picking up some dark chocolate. And, what's this!? Some piney and citrusy hops! Outstanding! T- The taste is just incredible. Astringent right out of the hole. Makes your eyes pop. But then it leads to a wonderful dark chocolate and milk chocolate. A hint of roast. Everything a nice american stout should be. Then the dry-hopped finish and kick of a great piney and bittering hops. Superbly balanced. M- medium body, light carbonation. A bit prickly. Bittering and dry aftertaste. I think this is caused by the hops. Not sure. But a different mouthfeel for sure than your average stout. O- A highly sessionable and drinkable stout! And you get best of both worlds....stout and hops! Love it! 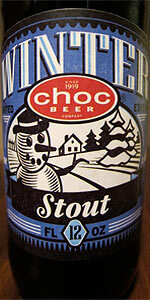 Great winter brew, Choc!